Composer is an application package manager for PHP. It provides a standard format for dependencies management of PHP software and required libraries. It was developed by Nils Adermann and Jordi Boganiano. It was released on March 1, 2012. In this tutorial, we will learn the installation process of Composer on CentOS. Execute the following command to download composer-setup on CentOS. The hash file code of composer-setup.php needs to be verified. We can verify it by writing the PHP code as shown below. Execute the file named as composer-setup.php to start the installation process of composer on CentOS. To access Composer globally on the terminal, we need to copy the binary executable file of composer which is composer.phar into /usr/bin/. Use the following command for this purpose. 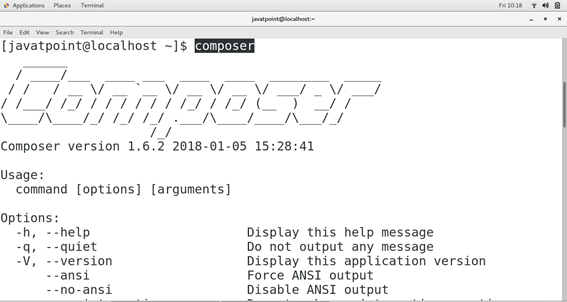 Just type composer on the terminal to check whether Composer is globally installed on the system or not. Hence, we have successfully installed and get started with Composer on the terminal.